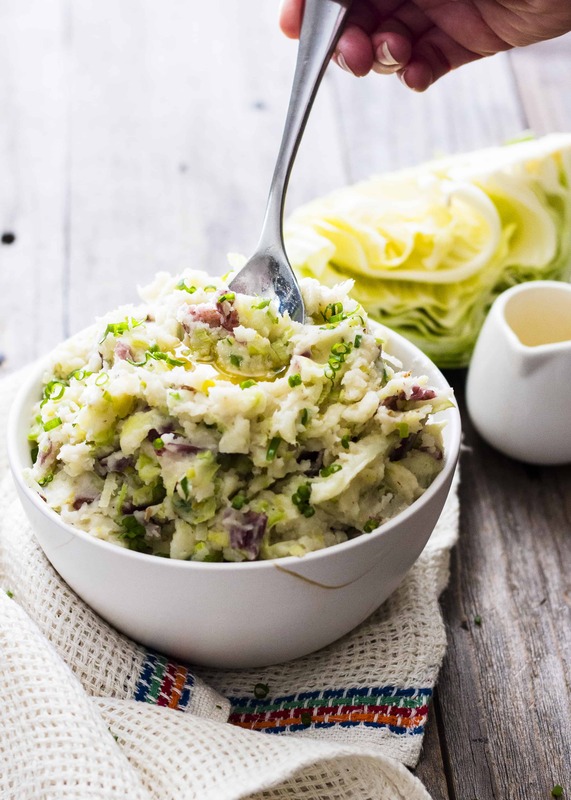 Colcannon is pure traditional Irish comfort food at it’s absolute best. Nothing beats a good Irish potato recipe, especially one that combines those potatoes with lots of garlic, leeks, cabbage and spring onions. This is one traditional Irish dish that will make it back to your family table time and time again. 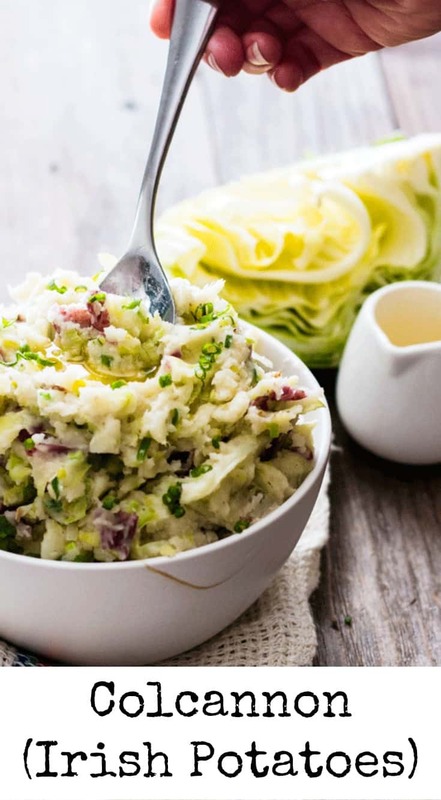 Is Colcannon a St Patrick’s Day Food? I have such fond memories of growing up in Ireland, and the one that stands out the most is enjoying a big steaming hot bowl of colcannon while the rain pelted down outside. Apparently it is a St Patrick’s day favorite, however, as kids we were usually out at the local St Paddie’s Day festival and the (family friendly) pubs, so I assume we were eating sausages and chips, rather than anything home-cooked. For us, Colcannon was more of a comforting meal in itself, and we enjoyed it quite regularly. I recently realized I have never actually made colcannon for my kids or husband before, which is weird because I ate it SO MUCH growing up, so I was super excited to try it out on them. I am happy to report they shoveled this down after a day out exploring at the park. Just so you are in the know, Colcannon just so happens to be the perfect hangover food! So if you find you have celebrated a wee bit too much this St Patricks Day, get a bowl of this into you, and you will be set (speaking from a lot of experience in my college years). I See A Lot of Butter…Can This Be Made Vegan? 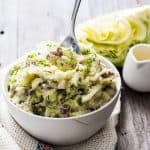 If you are vegan, and still want to enjoy some colcannon (and why wouldn’t you? ), you are in luck! I gave it a bit of an experiment, and if you sub in the butter for 3 tbsp dairy free milk and add 1-2 tbsp nutritional yeast, you can get a similar flavor. If you do manage to have any leftovers, they will store well in the fridge for a couple of days. Just use some milk to loosen them up a bit when you reheat and you will be good to go. If you want to try something different, then check out these Colcannon Tater Tots. They are a quick and easy way to use up those leftovers and I can guarantee that the whole family will devour them hot straight from the oven. Otherwise, they also make some great potato cakes! Hi there! Do I have to use avocado oil? Can I substitute it? Will it affect the taste if I do? I can’t find anything on it. It says that the taste will vary depending on whether or not you use unrefined, or refined avocado oil. Looking forward to trying this. Thanks! Hi Jordyn, no you can use any cooking oil of your choice. I just use avocado oil because it has a high heat point, but I have used extra virgin olive oil in this recipe too. Hope you enjoy! Is it possible to make these a day ahead? I am looking at something for a St. Patrick’s Day potluck and wanted to make it simple. I love this recipe. This dish is well loved in many countries, including the Netherlands. I have a friend from there who calls it stamppot or mash up. Such a great comfort food. There the traditional is with sauerkraut or kale. Thanks for the reminder. I have cabbage in the fridge right now! Oh my word. So delicious!! When I visited Ireland last year, I had so many great dishes, but I missed this one. I can’t wait to try it! I love this recipe! I can not wait to try it… it looks so cozy. 🙂 I spent some time in Ireland and this recipe brings back good memories. Oh thank you Dominique 🙂 Don’t you just love those nostalgic recipes that remind you of awesome times! I haven’t tried with sweet potatoes, but I can bet it would taste just as delicious!! Let me know how it turns out, I would love to know! My Nana (whose parents were from Ireland) and my Mum would make these every year for St. Patrick’s Day, and I do now too. One tradition we had was to put a coin in the colcannon, and whoever found the coin would have good luck for the next year. I never heard of any other family doing this, so it may have been just our tradition? Love your photos. I love colcannon! I cannot wait to try your recipe. Oh I hope you love it Elizabeth!! Omg these potatoes look so yummy!!!! I definitely need to give these a try! Definitely pinning! Yay, hope you love them CourtneyLynne! Oh, I miss Ireland! I visited there two summers ago. I am pinning this and making them for St. Patty’s day! Thank you. These look really delicious! I love anything that has potatoes in it! Those look so yummy! A st. party’s day dinner might be fun. This looks so delicious! Adding it to our St. Patrick’s Day dinner menu! Yum, this dish reminds me so much of home. My grandma always made this, but I never knew how she did it. She past away before I was really cooking for myself so I never had a chance to ask her. Thank you for sharing the recipe! I know what I’m making for dinner tonight!! Oh thank you for sharing memories of your grandma Shelly, that makes me happy 🙂 I love how food can trigger such lovely emotions from our past! I hope this version lives up to your grandmas! As a fellow Irish person all I can say is… yum. I love colcannon as do my kids and my husband. I haven’t made it in so long though. Thanks for reminding me of it. Oh you are so welcome! I hadn’t made it in years either, and now I think I am getting to the point of over-making it 🙂 So good though! I’ve never heard of this dish before. Now I want to try it. I’m all up for trying anything that’s different. I’ve never made anything like this before. Look delicious, can’t wait to try! I have actually never heard of this before, but it looks absolutely amazing! I am going to have to try it soon! I think my Indian mother and I must be part Irish, we both LOVE potatoes. This sounds delicious, I’m going to pin it and give it a try for St. Patrick’s Day this year. Thanks for sharing! I have never had anything like this before, but these potatoes sound awesome. I can’t wait to try them. I love every kind of potato possible and this sounds heavenly. I would add some fried Quorn chicken as a side dish and some olive oil salad. I am an Irish gal! Your recipe is yummy! My nanna would love it! My kids aren’t typically potato fans either (unless they’re fried!!! ), so maybe I should give this a try for them! It sounds delicious, and I’m sure my Irish-blooded husband would approve! Oh yeah, my kids will eat them if they are in the shape of french fries 🙂 But with these, they just guzzled them – no idea! I was skeptical given the green bits in there, but apparently they didn’t even notice!